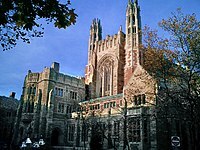 English: Yale University is a private university in New Haven, Connecticut, United States. It was founded in 1701 and is a member of the Ivy League. This page was last edited on 19 May 2018, at 05:31.